Buford Dillard Bagwell was also known as Buford H. Bagwell. He was born on 6 October 1930 in Monterey, Putnam County, Tennessee. He was the son of Burch Dillard Bagwell and Etta Lee Walker. Buford Dillard Bagwell married Martha Jo Harris before 1953. Buford Dillard Bagwell died on 26 February 2006 in Huntsville, Madison County, Alabama, at age 75. He was buried at Huntsville Memory Gardens, Huntsville, Madison County, Alabama. Elora Bagwell was born on 8 July 1920 in Monterey, Putnam County, Tennessee. She was the daughter of Burch Dillard Bagwell and Etta Lee Walker. Elora Bagwell married James Otis Pruden before 1951. Elora Bagwell died on 27 December 2003 in Decatur, Morgan County, Alabama, at age 83. Walter Fred Bagwell was born on 18 April 1923 in Monterey, Putnam County, Tennessee. He was the son of Burch Dillard Bagwell and Etta Lee Walker. Walter Fred Bagwell married Ellen Genetta McHenry before 1951. Walter Fred Bagwell died on 21 February 1973 in Huntsville, Madison County, Alabama, at age 49. He was buried at Souble Springs Cemeter, Double Springs, Putnam County, Tennessee. Betty Ruth Bagwell was born on 3 October 1932 in Cookeville, Tennessee. She was the daughter of Burch Dillard Bagwell and Etta Lee Walker. As of 5 January 1952,her married name was Karabinos. Betty Ruth Bagwell married Andrew Robert Karabinos on 5 January 1952. As of 20 July 1974,her married name was Wathen. Betty Ruth Bagwell married James Bernard Wathen on 20 July 1974 at Scottsboro, Jackson County, Alabama. Betty Ruth Bagwell died on 21 July 2001 in Huntsville, Madison County, Alabama, at age 68. Andrew Robert Karabinos married Betty Ruth Bagwell, daughter of Burch Dillard Bagwell and Etta Lee Walker, on 5 January 1952. [S575] Letter, Drury Richard Bagwell to William Hyder Bagwell, Unknown Date. [S300] Brent Holcomb, Marriages of Rutherford County, North Carolina, 1779-1868. Jonathon Stanhope Harrison Bagwell was also known as Stanhope Harrison Bagwell. 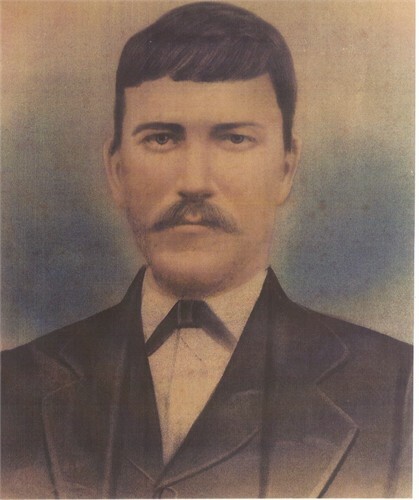 He was born on 22 April 1837 in Creek area, Rutherford County, North Carolina.1 He was the son of William O. Bagwell and Mary Catherine Ballard. Jonathon Stanhope Harrison Bagwell married Tempa Malinda Ledbetter on 20 November 1859 at Rutherford County, North Carolina.2 Enlisted as a Private on 2 September 1861 at the age of 24. Enlisted in Company C, 34th Infantry Regiment North Carolina on 25 Oct 1861. Fought on 29 Mar 1862 at Hatcher's Run, VA. Fought on 3 Jun 1862 at Malvern Hill, VA. Fought on 25 Jun 1862 at Richmond, VA. Fought on 25 Jun 1862 at Near Richmond, VA. Fought on 26 Jun 1862 at Richmond, VA. Fought on 26 Jun 1862 at Mechanicsville, VA. Fought on 26 Jun 1862 at Gaines' Mill, VA. Fought on 27 Jun 1862 at Mechanicsville, VA. Fought on 27 Jun 1862 at Savage's Station, VA. Fought on 27 Jun 1862 at Harrison's Landing, VA. Fought on 27 Jun 1862 at Gaines' Mill, VA. Fought on 28 Jun 1862 at Richmond, VA. Fought on 28 Jun 1862 at Harrison's Landing, VA. Fought on 30 Jun 1862 at Frazier's Farm, VA. Fought on 30 Jun 1862 at Frayser's Farm, VA. Fought on 15 Jul 1862 at Richmond, VA. Fought on 26 Jul 1862 at Gaines' Mill, VA. Fought on 28 Aug 1862 at 2nd Manassas, VA. Fought on 29 Aug 1862 at 2nd Manassas, VA. Fought on 1 Sep 1862 at Ox Hill, VA. Fought on 12 Sep 1862 at Fredericksburg, VA. Fought on 12 Sep 1862 at Frederick, MD. Fought on 20 Sep 1862 at Shepherdstown, WV. Fought on 29 Sep 1862 at Warrenton, VA. Fought on 1 Oct 1862 at Warrenton, VA. Fought on 4 Dec 1862 at Winchester, VA. Fought on 15 Dec 1862 at Winchester, VA. Fought on 1 Jan 1863 at Orange Court House, VA. Fought on 15 Mar 1863. Fought on 1 May 1863 at Chancellorsville, VA. Fought on 2 May 1863 at Chancellorsville, VA. Fought on 4 May 1863 at Chancellorsville, VA. Fought on 5 May 1863 at Chancellorsville, VA. Fought on 15 May 1863 at Culpepper, VA. Fought on 15 May 1863 at Chancellorsville, VA. Fought on 7 Jun 1863 at Fredericksburg, VA. Fought on 23 Jun 1863 at Petersburg, VA. Fought on 4 Jul 1863. Fought on 5 Jul 1863 at Gettysburg, PA. Fought on 6 Jul 1863 at Williamsport, MD. Fought on 12 Jul 1863 at Funkstown, MD. Fought on 12 Jul 1863 at Hagerstown, MD. Fought on 13 Jul 1863 at Falling Waters, MD. Fought on 14 Jul 1863 at Falling Waters, MD. Fought on 1 Aug 1863 at Culpepper, VA. Fought on 1 Aug 1863 at Brandy Station, VA. Fought on 13 Aug 1863 at Battery Harrison, VA. Fought on 20 Jan 1864 at Richmond, VA. Fought on 5 Mar 1864 at Wilderness, VA. Fought on 3 May 1864 at Wilderness, VA. Fought on 12 May 1864 at Chancellorsville, VA. Fought on 21 May 1864 at Spotsylvania Court House, VA. Fought on 22 May 1864 at Hanover Junction, VA. Fought on 23 May 1864 at North Anna River, VA. Fought on 23 May 1864 at Jericho Mills, VA. Fought on 23 May 1864 at Hanover Junction, VA. Fought on 24 May 1864 at Hanover Junction, VA. Fought on 24 May 1864 at Hanover Court House, VA. Fought on 24 May 1864 at Jericho Mills, VA. Fought on 25 May 1864 at North Anna River, VA. Fought on 27 May 1864. Fought on 28 May 1864 at South Anna River, VA. Fought on 13 Jun 1864 at Riddle Shop, VA. Fought on 16 Jun 1864 at Near Petersburg, VA. Fought on 21 Jun 1864 at Near Petersburg, VA. Fought on 22 Jun 1864 at Near Petersburg, VA. Fought on 4 Jul 1864 at Near Petersburg, VA. Fought on 15 Jul 1864 at Near Petersburg, VA. Fought on 9 Aug 1864 at Near Petersburg, VA. Fought on 20 Aug 1864. Fought on 23 Aug 1864 at Reams' Station, VA. Fought on 25 Aug 1864 at Reams' Station, VA. Fought on 25 Aug 1864 at Fort Stedman, VA. Fought on 1 Sep 1864 at Petersburg, VA. Fought on 15 Sep 1864. Fought on 30 Sep 1864 at Jones' Farm, VA. Fought on 6 Oct 1864. Fought on 8 Oct 1864 at Near Petersburg, VA. Fought on 13 Oct 1864. Fought on 14 Nov 1864 at Petersburg, VA. Fought on 4 Mar 1865 at Near Petersburg, VA. Fought on 15 Mar 1865 at Near Petersburg, VA. Fought on 25 Mar 1865 at Fort Stedman, VA. Fought on 29 Mar 1865 at Hatcher's Run, VA. Fought on 30 Mar 1865 at Hatcher's Run, VA. Fought on 30 Mar 1865 at Near Petersburg, VA. Fought on 31 Mar 1865 at Hatcher's Run, VA. Fought on 1 Apr 1865 at Hatcher's Run, VA. Fought on 1 Apr 1865 at South Side Railroad, VA. Fought on 2 Apr 1865 at Jarratt's Station, VA. Fought on 2 Apr 1865 at Hatcher's Run, VA. Fought on 2 Apr 1865 at Near Petersburg, VA. Fought on 2 Apr 1865 at Sutherland's Station, VA. Fought on 2 Apr 1865 at South Side Railroad, VA. Fought on 3 Apr 1865 at Petersburg, VA. Fought on 3 Apr 1865 at Richmond, VA. Fought on 3 Apr 1865 at South Side Railroad, VA. Fought on 3 Apr 1865 at Sutherland's Station, VA. Fought on 3 Apr 1865 at Amelia Court House, VA. Fought on 3 Apr 1865 at Appomattox River, VA. Fought on 4 Apr 1865 at Amelia Court House, VA. Fought on 4 Apr 1865 at Burkeville, VA. Fought on 4 Apr 1865 at Appomattox River, VA. Fought on 4 Apr 1865 at Amelia Springs, VA. Fought on 5 Apr 1865 at Amelia Court House, VA. Fought on 6 Apr 1865 at Burkeville, VA.
Zebulon Vance Whiteside was born on 15 February 1860 in Rutherford County, North Carolina. He married Mary Hester Bagwell, daughter of Jonathon Stanhope Harrison Bagwell and Tempa Malinda Ledbetter, before 1879.1 Zebulon Vance Whiteside died in 1947 in Hendersonville, Henderson County, North Carolina. He was buried at Fruitland Cemetery, Henderson County, North Carolina. William Arthur Whiteside was born on 6 January 1882. He was the son of Zebulon Vance Whiteside. William Arthur Whiteside died on 13 July 1911 at age 29. [S2841] Email from Nancy Simon Grafton dated September 2014 to Hunter Wayne Bagwell - Subject Line: Beatrice Marie Bagwell and Family. Homer Lee Bagwell was born on 20 April 1898 in Henderson County, North Carolina. He was the son of William Weldon Bagwell and Susan Ann Newman. Homer Lee Bagwell died in June 1978 in Homestead, Florida, at age 80. [S1428] Email from Mark W. Bagwell dated August 2010 to Hunter Wayne Bagwell; Subject Line: George Walon Bagwell. Descendents. Her married name was Livingstone. Ida Elizabeth Bagwell married Joseph Franklin Livingstone. Ida Elizabeth Bagwell was born on 1 September 1866. She was the daughter of Jonathon Stanhope Harrison Bagwell and Tempa Malinda Ledbetter. Ida Elizabeth Bagwell died on 18 October 1957 at age 91. Joseph Franklin Livingstone married Ida Elizabeth Bagwell, daughter of Jonathon Stanhope Harrison Bagwell and Tempa Malinda Ledbetter. Joseph Franklin Livingstone was born on 27 April 1845. He died on 9 March 1926 at age 80. George Dewey Livingstone was born on 28 May 1899. He was the son of Joseph Franklin Livingstone and Ida Elizabeth Bagwell. George Dewey Livingstone died on 12 December 1955 in Hoopers Creek, Henderson County, North Carolina, at age 56.